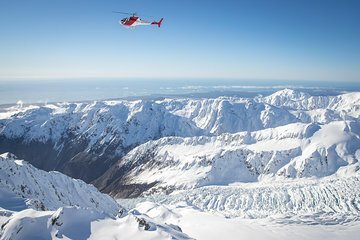 Fly above Mount Cook’s glacial icefalls, crevasses, and neves on a 40-minute helicopter flight from Franz Joseph, and see both of New Zealand’s West Coast glaciers from the air. Your route crosses the spine of the Southern Alps, circles the summit of Mount Cook, then touches down for a snow landing, with spectacular aerial views of Westland Tai Poutini National Park throughout the flight. Make your way to a helicopter base in the center of Franz Josef township, then check in for your helicopter tour; departures are available throughout the day, and you can request your preferred time when booking. Climb into the helicopter and lift off above the town, flying across the two massive glaciers that creep through Westland Tai Poutini National Park. You’ll spot both Franz Josef Glacier and Fox Glacier as you cross the mountains that parallel New Zealand’s West Coast, then see the distinctive, jagged profile of Mount Cook, the country’s highest peak. Three summits tower over the two glaciers on Mount Cook’s flanks, now protected as part of a UNESCO World Heritage Site. See the mountain up close when the pilot touches down for a snow landing—you’ll have some time to take in the high altitude views and mountain air, and snap some photos with an unforgettable backdrop. Following the snow landing, start the flight back towards the coast and Franz Josef township, where this 40-minute helicopter flight concludes. It was a gorgeous sunny day but we didnt get to do the 40 min mt cook spectacular helicopter flight due to strong winds over mt cook so they changed it to a 30 minute flight over fox and Franz Josef glaciers with a snow landing and it was great and still well worth it! Stunning scenery and it was great up in the snow line as they had had some fresh snow overnight. Best views of the glaciers! A once in a lifetime experience for my wife and I. Brilliant flying between the snow capped mountains and spectacular walking around the top of the glacier. Great pilot!